Being an amateur film-lover, Lincoln pop-culture fan-girl, Daniel Day-Lewis enthusiast, and recognized Joseph Gordon-Levitt friendship daydreamer – the release of Stephen Spielberg’s Lincoln was easily given the title “the Cinematic apex of my life.” With that combination, it is likely impossible for me to ever objectively review Lincoln – but in retrospect I think that is for the best. 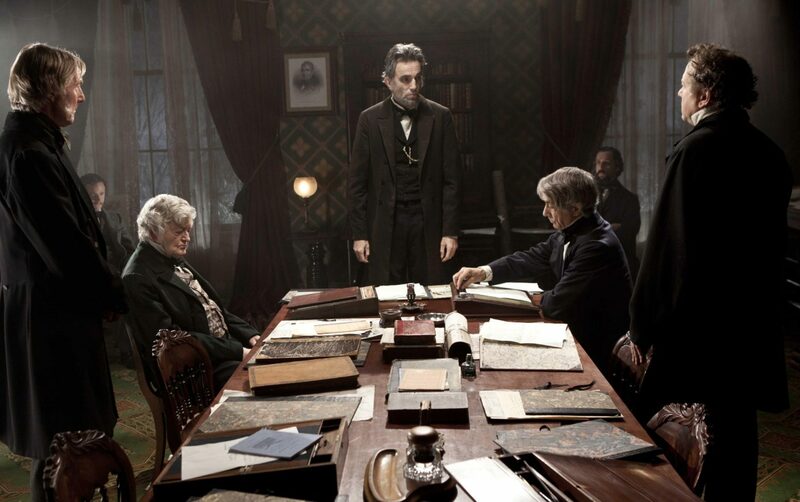 NOTE: This post WILL contain spoilers for Stephen Spielberg’s Lincoln. I managed to see the film the week before it was released nationally, which means the same week as the Presidential election – which is just to say that going into – it partisanship was on the mind. In thinking about the film in the past months I realize how beautifully Spielberg was able to capture the transcendent power of Lincoln’s leadership. Immediately after the film – I was somewhat disappointed. I felt as though the inclusion of humor was trite and that the writing was a tad too saccharine to ring true to the issues at hand. But now I wish to recant my initial feelings. It was a good film – and more than anything an excellent thought provoker. In writing this film as Tony Kushner did, he was able to capture a microcosm of sentiment not easily manifested – he transported the audience with ease to a world of political division where the means needed to achieve vital and fundamental changes to the fabric of our nation were dirty, manipulative and still downright patriotic. For most people the scope of the film was the biggest challenge – why call it Lincoln when the main subject of the film is actually the 13th amendment? While the 13th Amendment was a monumental change to our nation and cemented the inklings of equality laid out in Lincoln’s Emancipation Proclamation – it was also a fascinating case study into the kind of politics that gets things done. 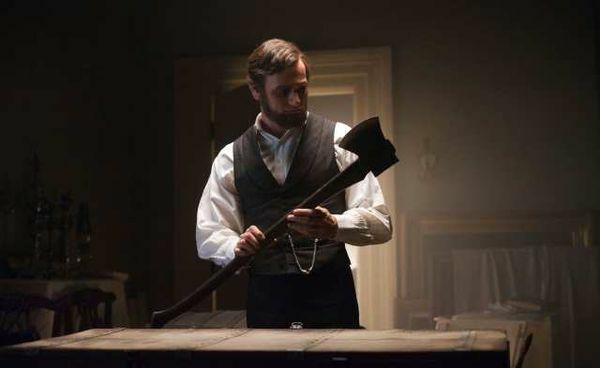 Doris Kearns Goodwin’s Team of Rivals: The Political Genius of Abraham Lincoln (which apparently Spielberg got the movie rights to long, long ago) outlines the deft maneuvering and really outside of the box politicking that defined Lincoln’s presidency. The “team of rivals” philosophy of leadership is a popular one – but perhaps too simplistic to describe the universe you can create within a film. Instead this philosophy, this Lincoln-style Presidential-innovation that comes across so clearly in the telling of the passage of the amendment to end slavery – is, simply-put, defined by Lincoln himself. Defining Lincoln is a monumental task (pun-intended) – but luckily, Spielberg wrangled in the one actor out there today who was without a doubt capable of bringing the persona and thoughtful creature of Lincoln to life: Daniel Day-Lewis. More than nuanced, his performance was raw. In his eyes you saw the lingering pain of losing a child and the turmoil of a challenged marriage. His slightest movements echoed the myth of Lincoln that we want to be true – while also mapping it gloriously on to the reality of an imperfect man. It was in those challenged moments – a fight with Mary Todd, the disappointment of Robert, the doubt of his colleagues – that Spielberg managed to capture something we haven’t seen quite so frankly in most portrayals of leadership on film: vulnerability. Seeing that vulnerability made him that much more real. At no point was I in awe of the man, rather I felt for a moment I was able to step in his shoes – which seems to be the clear intent of the film in the opening sequence shot from that Presidential POV. You have to ask yourself- what would you do were you in Lincoln’s position? What are the limits of the means you can use that would still be justified to achieve a noble end? While the film gives you little time to ponder these issues – they sit with you, they linger and they resonate with the world around us today. As an audience, we becomes drawn into the tender exposure of the day to day life and political operations of the Presidency during war and we learn to steel ourselves with resolve – which waivers only with the one dubious decision to display Lincoln’s body in repose. (Which even Sam Jackson took issue with). My list of complaints was initially lengthy: why include Robert Todd at all (despite my love of JGL), why show his body, why squander the fantastic opportunity to use two actors capable of great depth like John Hawkes and James Spader on roles written in the style of bumbling Disney villains. But ultimately my list of loves were stronger: a beautifully relatable portrayal of Mary Todd, a Congressional conversation worthy of the best minutes of C-SPAN and of course a once in a lifetime bringing to life of a long gone hero. A few weeks ago I had the opportunity to take some friends to the Presidency exhibit at the National Museum of American History. While there I found a short spot discussing previous portrayals of the Presidency on film. In that film there was one line that stuck with me which said: “It’s not accuracy, but drama that drives most American films.” And while we cannot look at Lincoln as a historical text, it captures a flavor rarely seen on the big screen and nearly impossible to convey in text – a mélange of history, drama and emotion. Whatever we want to call Lincoln, a movie, a masterpiece, a poorly-titled film – it fulfilled its namesake’s declaration to be a good one. Well, this is pretty crass. I’m consistently amazed by the decisions people make — and let’s be honest here: in this instance I’m in awe of the stupidity and insensitivity of this placement. 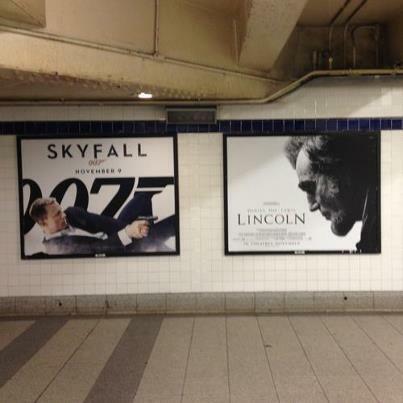 Nonetheless.. saw Skyfall last night andcannot wait to see Lincoln this Sunday. 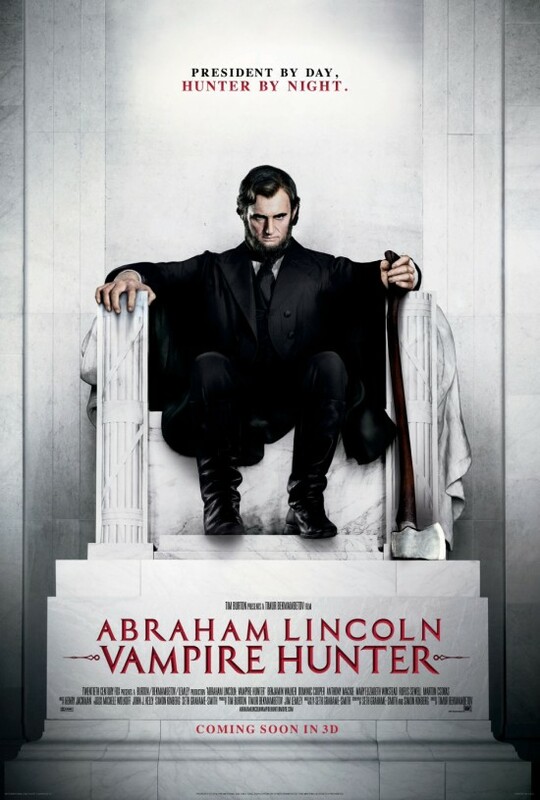 Loved this article detailing all titles that Abraham Lincoln: Vampire Hunter will be released under. What if I just want to see Secret Diary of the Vampire Hunter? Age Old Questions…. 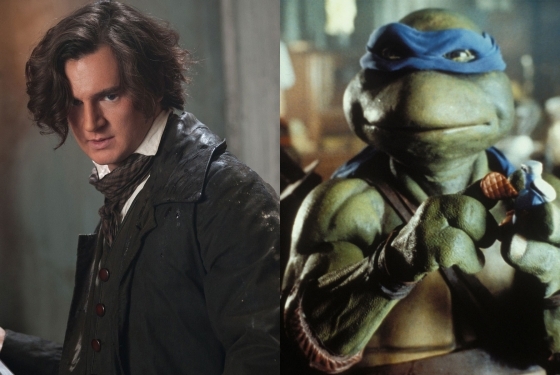 About Lincoln and Ninja Turtles. The post uses Abraham Lincoln: Vampire Hunter as a mini-case study for how audiences approach and engage fiction and reality in media today – definitely worth a read; and something more to consider as coverage & AL:VH fanaticism heats up. Yet another piece of information that makes me feel slightly better about this whole ordeal. Bicentennial fever was pretty epic back then and the fact that he purports to have actually done some research gives it some legitimate historical ties makes me feel a little better too. We’ll see though – I’m going to begin reading it this weekend. President By Day. Hunter By Night. Hadn’t seen this poster yet, but it made me admit something to myself. My ambivalence is turning. My interest is piqued. I am kind of legitimately excited to see it now. So what changed? Caleb Deschanel. 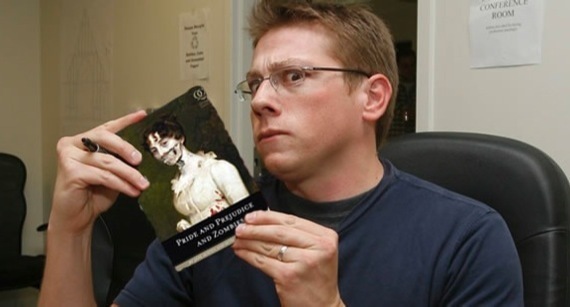 Father of Emily and Zooey. Director of Photography on The Right Stuff, The Natural, The Patriot and the Passion of the Christ. Director of three damn fine episodes of Twin Peaks… and now cinematographer for Abraham Lincoln: Vampire Hunter. I guess I figured, if this man is involved — it has to be at least somewhat decent? Right? Maybe? Well in any event — I’m going to try and give this film a fair shake.. and in my quest to do so I will also brush up on my Timur Bekmambetov (director) films and may actually read the book. I’ve got to admire the fanbase that this film is conjuring up – they’ve got serious verve and evidently… a lot of time on their hands. ARE YOU A PATRIOT OR A VAMPIRE? 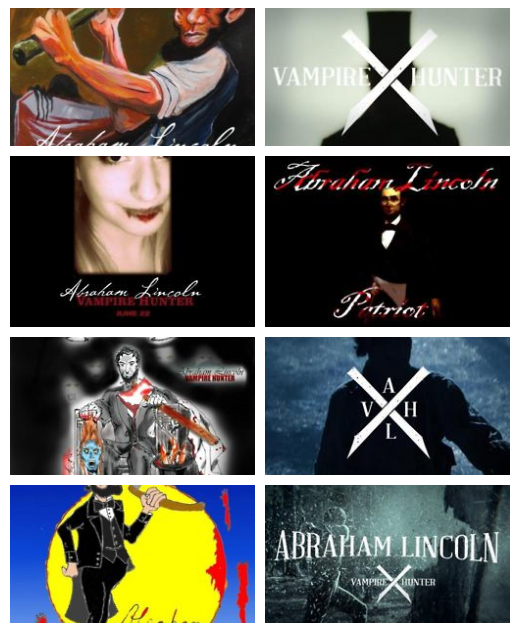 Head over to the Abraham Lincoln: Vampire HunterOfficial Facebook and cast your vote for the best fan-made posters by liking your favorites!